MSC is experimenting with new deployment options for its traditional 13,000 teu Asia-Europe workhorses as they are rapidly displaced on the route by deliveries of the ‘new normal’ lower unit cost 18,000-20,000 teu ultra-large container vessels (ULCVs). 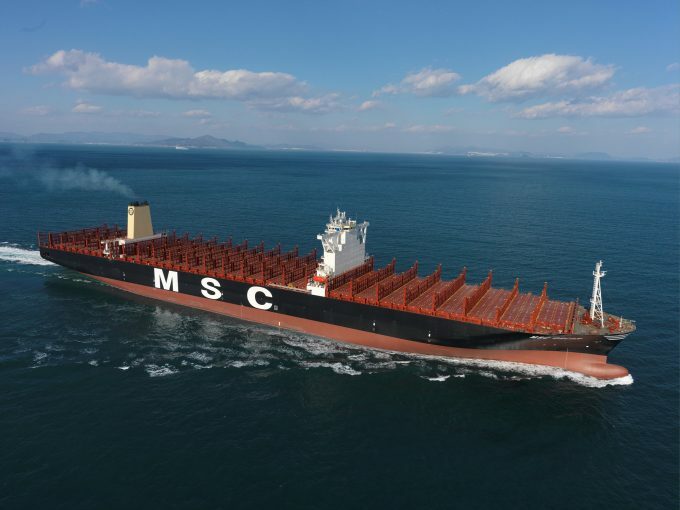 Alphaliner reported today that several ocean carriers are exploring new route possibilities for redundant 13,000 teu vessels and noted that MSC is starting to send ships of this size to India, West Africa and the South American west coast. The obvious cascade strategy for surplus 13,000 teu tonnage is the transpacific Asia-US west and east coast tradelanes, but weak US demand has obliged carriers to look to deploy these ships elsewhere. And in an unprecedented move, carriers are downscaling their transpacific operations ahead of the peak season, and those with surplus 13,000 teu tonnage clearly feel that it is not the right time to force larger vessels onto the trade – hence the experiment with other routes. Indeed, the embarrassment of CMA CGM’s misjudged attempt to deploy a series of 18,000 teu ships on an Asia-US west coast string earlier this year proved that the trade was far from ready for the big jump to ULCVs. “MSC has assigned this month two 12,552 teu vessels to its standalone Asia-South Africa-West Africa ‘Africa Express’ service and the carrier furthermore intends to shift several 13,000 teu ships to both this service and to the Asia-west coast South America ‘Andes Express’ service in the coming weeks,” said Alphaliner. The consultant added that the trigger for this cascading was MSC taking delivery of the 19,224 teu MSC Jade at the end of May, and the expected delivery soon of three more 19,000 teu ships, all of which will be phased into 2M Alliance’s Asia-Europe loops. Since late 2014, MSC has been at the forefront of the introduction of larger tonnage to the West African market after it decided to hub its Asia-West Africa volumes at Lome and deploy 11 ships of 8,000-9,400 teu on the route. It was the first carrier to create a single hub in West Africa with its consolidation of cargo at the Togo port and its network of local feeders serving other ports. Apart from some initial teething problems the strategy of hub and spoke at Lome seems to have worked well for MSC in West Africa, not least because it avoids schedule disruption to its main line service caused by the often severe congestion at ports along the coast. Elsewhere, reports Alphaliner, MSC has cascaded three 13,000 teu ships to its Europe-Indian subcontinent ‘Himalaya Express’ joint service with the Shipping Corporation of India (SCI). They are currently the largest ships to call at the Indian subcontinent and run alongside 9,000-11,000 teu units on the service provided by MSC, together with a solitary 8,500 teu vessel operated by SCI. Meanwhile, the deployment of three 13,000 teu ships into the Andes service, which it operates with CMA CGM, COSCO, Hapag-Lloyd, Hamburg Sud and HMM, will represent a further significant increase of capacity. The service is currently operated with 12 ships of 8,800-10,600 teu – eight of which are supplied by MSC.